He does best when he knows what to expect. Most kids do, actually, but knowing what the day will look like is so important to kids who struggle. However, when your kid has occupational therapy twice a week, speech therapy twice a week, neurologist appointments, blood work, psych appointments...it can be impossible to have a consistent schedule. 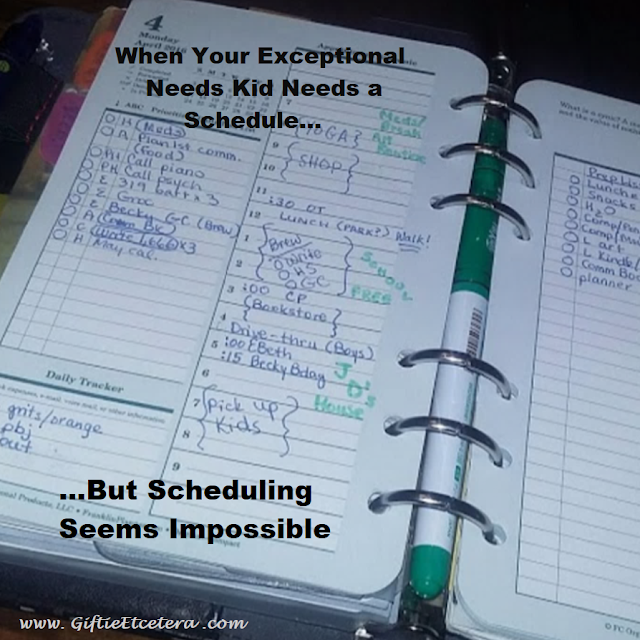 If your child needs a schedule, but making one seems impossible, there are things that you can do. Even when your schedule is always changing, have consistent routines. For example, we have a morning routine, an after school routine, and a bedtime routine. They are actually written in wet-erase marker on a dry-erase board, so that my child can check off each item. If we are going to deviate from those routines, I warn him as far in advance and as often as possible beforehand. "Tomorrow morning, you have blood work, so we'll skip breakfast and get pancakes after the lab visit." If your child can peek at your schedule, they get an idea that they are not the only people with busy days. Let them see that you have responsibilities, too. But make sure to also have the kid's schedule in a different color, so they can see what to expect. Show it and read it to them. We do that the night before and in the morning over breakfast. If something changes, warn your kids as soon as possible! And tell them why. "We were going to have a play date tonight, but John is sick. He will come Saturday instead. I know that is disappointing. What to have a Family Movie Night instead?" My kiddo is only 7, so he doesn't have a planner yet. But consider a small planner with a schedule in it for your kid. It'll teach he or she to learn to use one! I am following you from Share It Saturday. I know I need a plan - of tasks to do. I have decided to make a list of 5 each day. So far it is working well and I don't feel overwhelmed.